Now it’s been awhile since I’ve posted anything related to food, but this one is so amazingly simple that I thought many of you would enjoy it. This past weekend I went out with my friend Kamille and she took me to a Korean chicken restaurant called BBQ Chicken. I’ve wanted to go there before since it’s endorsed by my favorite Korean girl-group the Wonder Girls, and so we took a trip over to Makati and ate there. They had some pretty good fried chicken but we also got to try their rice cake dish called ddeokbokki. 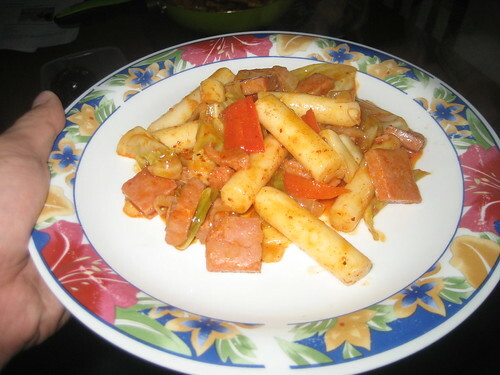 Ddeokbokki is essentially a dish that consists of glutinous rice cakes, spring onion, gochujang sauce (which is a spicy Korean pepper paste) and typically fish cakes. It was amazingly spicy, but still amazingly good so I sought out the ingredients to make it before I came back to Los Banos. The recipe I used was from MyKoreanKitchen.com and can be found here. Although you can read what the author has told you I’ll just list the recipe here as well. Here’s a tip if you’re using frozen rice cakes instead of freshly made ones. Put the frozen rice cakes into a bowl of water for 30 minutes. This will help thaw them out. Many people say that you should put these in cold water, but I found that since the rice cakes are already frozen, the water will automatically become really cold once you put them into a container of water. Make sure the water covers all the rice cakes completely. After 30 minutes you should be able to pull the rice cakes apart easily, which is what you’ll need for later. 1. Preheat the wok for 10 seconds. 2. Add some oil and add the onion. Stir for a bit. 3. Add the cabbage and stir it as well. 4. 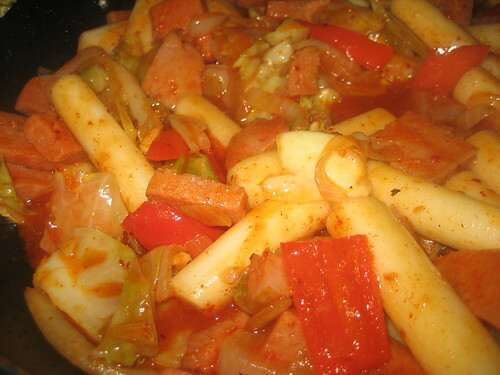 Add the rice cakes, fish cakes, sauce and water. Stir all the ingredients together. 5. Add the spring onion and stir again. 6. Once all the vegetables have been cooked, serve the meal as desired. And there you have it. 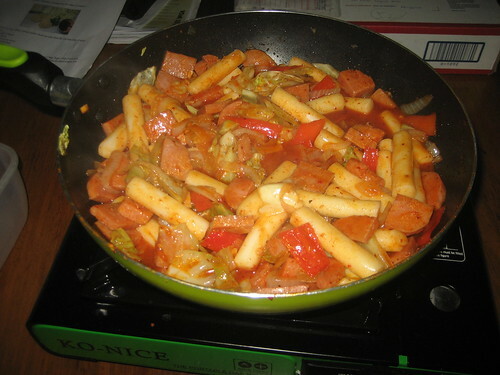 A simply made, but delicious Korean snack dish, ddeokbokki. Here’s how mine turned out. I didn’t have any fish cakes with me, so I decided to substitute some spam. I made double this recipe (so I could save some for later), so I used an entire can of spam. It was the right amount and went with the meal well. I suggest you do the same if you want to have some kind of meat in the dish if you don’t have any fish cakes to spare. I also added some red pepper slices because I like spicy food. But you don’t have to, if you don’t want to. Simply put this had enough kick to make me sweat, but it was definitely delicious. You have to try this one at least once. I think many of you would enjoy it!